Bush St. and Stockton St. The Maltese Falcon begins with the murder of Sam Spade’s partner Miles Archer, a crime that takes place in a fog-shrouded San Francisco alley. 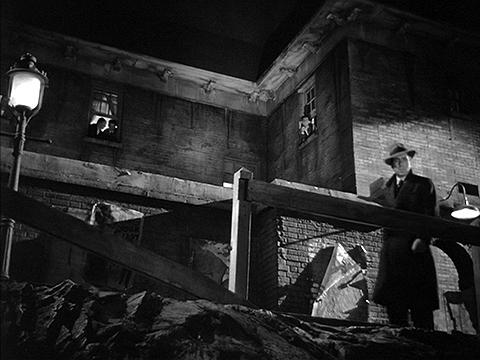 As portrayed in John Houston’s 1941 film, however, the location of the murder seems rather puzzling. After an establishing shot of a street sign — the intersection of Bush St. and Stockton St. — we see Archer’s feet walking along a dirt path. He turns to face the person he is meeting. A pistol enters the frame and fires at close range. Archer falls backward, breaks the wooden fence behind him and falls to the bottom of an earthen embankment. Archer rolls down the dirt hill. Were it not for the street sign, the dirt path and bare hillside would suggest a lonely country road. When Archer’s partner Sam Spade arrives, however, we see the location from the reverse angle, with people peering out of apartment windows opposite the railing through which Archer fell. On the far side of the ditch is an urban cityscape. Where is this place? The reverse shot shows the urban setting of the crime scene. Behind Spade and Polhaus, the ditch and the city skyline. The Dashiell Hammett novel on which the film is based is quite specific about the location. And, although the film was shot on a soundstage, the movie seeks to accurately recreate the locale. 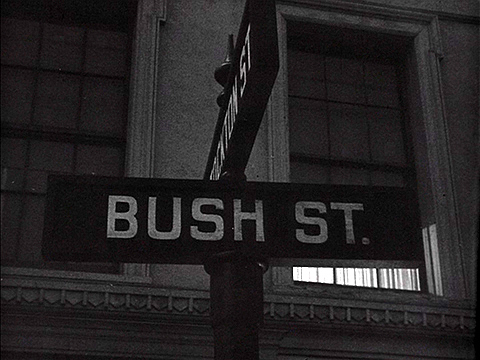 “Where Bush Street roofed Stockton before slipping downhill to Chinatown, Spade paid his fare and left the taxicab,” Hammett wrote in the 1930 novel. Spade exits his cab on Bush Street above the Stockton tunnel. The iron-railed stairs that lead down to Stockton St. The ugly stairs leading from Bush Street down to Stockton still remain. The McAlpin apartments on the west side of Stockton St.
A car exits the Stockton tunnel. Looking south down Burritt St. This is the alley where Spade’s partner, Miles Archer, was shot down. 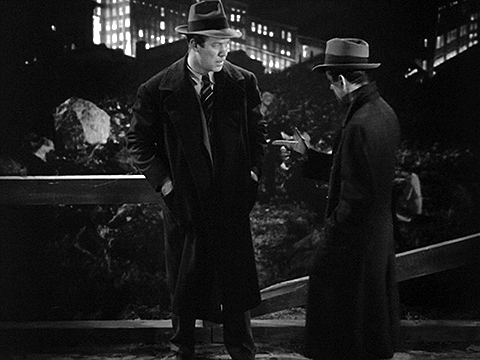 The expanding urban environment has altered the location since 1928 when The Maltese Falcon takes place. The McAlpin apartments on the west side of Stockton Street and the east side of the alley didn’t then extend as far north as they do today. In their place was an embankment that led down from Burritt Street to billboards that lined the entrance to the Stockton tunnel. This was the dirt hillside where Archer’s body fell that fateful night. Although the northern extension of the McAlpin apartments has replaced the rustic hillside, little else has changed in over eight decades. You can still follow in the footsteps of Samuel Spade to the scene of the crime that enmeshed him in the search for the killer and began the quest for the jewel-encrusted statue of a falcon. Images from The Maltese Falcon are from a copyrighted film, the copyright for which is most likely owned by the film’s production company and/or distributor and possibly also by any actors appearing in the image. 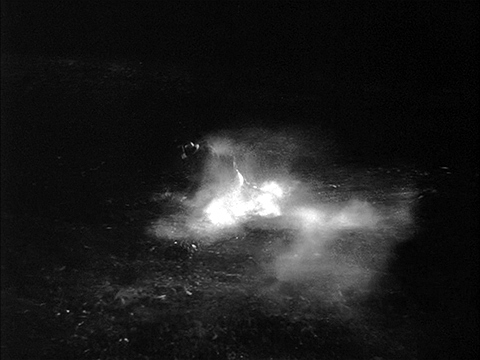 It is believed that the use of a web-resolution screenshot for identification and critical commentary on the film and its contents qualifies as fair use under United States copyright law. Also worth a look is Don Herron’s book “The Dashiell Hammett Tour”. In real life and for many years, dressed in a trench coat and fedora, Don Herron guides interested literary folk to important Hammett sites. Surprisingly many of these 1920s sites still exist in “hi tech” San Francisco. Most are places from the Maltese Falcon but other Hammett stories are included. The window of Herron-led hikes seems to become briefer each year. The book removes the timing issues. Another Herron book, long out of print, is “The Literary World of San Francisco & its Environs”, a wonderfully rich treasure hunt of Northern California literary sites and the writers who are worth noting, including Mark Twain, Jack London, Hammett, etc. Although I’ve never gone on Herron’s tour, I do have a copy of his book, The Dashiell Hammett Tour, that I picked up at the old Stacey’s Bookstore on Market Street years ago. It’s a great resource. I also have a wonderful edition of The Maltese Falcon from North Point Press that I purchased at City Lights Bookstore. 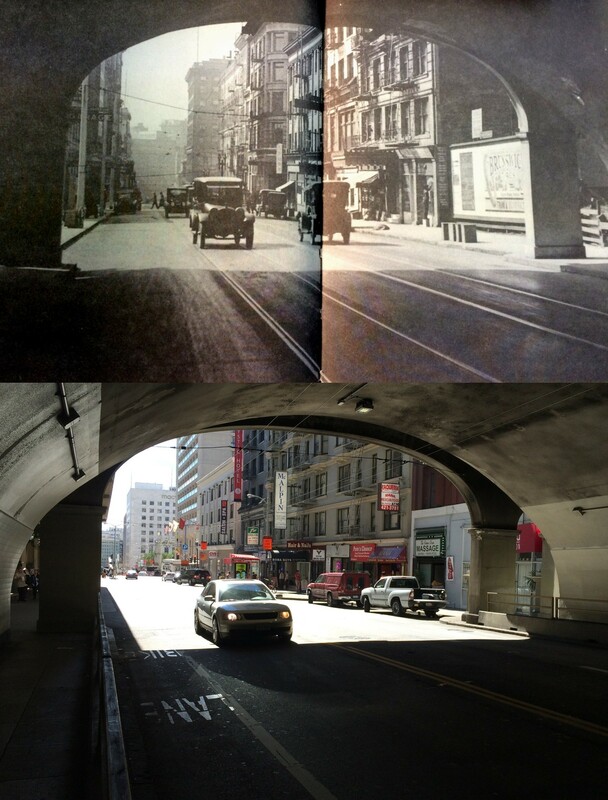 This edition includes period photos of many of the story’s San Francisco locations. In the the book the billboard was placed across the front of a gap between two store-buldings. Looking at the picture we can only see one of them. I never found an old picture of that place in the opposite direction facing the tunnel entrance. And why would anyone needed to be hunkered on his heel to look under the billboard.